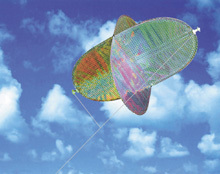 This highly reflective holographic kite flashes and spins in the air and acts as a general deterrent should any birds get used to the delta kite. For use with the kitepole in light to medium winds. The Relective Spinning Kite ref 4201 has highly reflective, holographic surface that flashes as it spins and acts as a general deterrent should any birds get used to the Birdscarer Kite. This should be used with the Kitepole ref 0760, in light to medium winds. It is always a good idea to switch from one type of birdscarer to another as birds can get used to even the most scary objects.